Ergonomic design helps reduce hand fatigue. Breathable poly/cotton back. 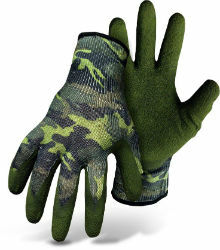 Flexible knit wrist seals out dirt and helps keep hands warm by preventing air from getting inside or escaping. Conveniently fits under clothing sleeves. Textured latex coated palm for superior grip.